Now your conferences and meeting events can reach an unlimited audience. 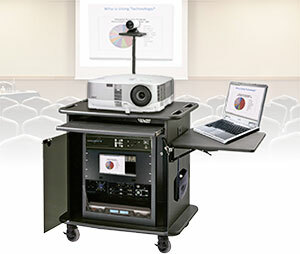 The MediaPOINTE Mobile HD Webcaster contains everything a meeting organizer or hotel AV staff needs to capture live conferences and presentations, and stream them live or On Demand (VOD) over any network. It combines content (PowerPoint, video, etc.) with a live camera feed of the presenter into a professional dual image format that can be viewed anywhere, anytime on a PC or mobile device. The HD Webcaster is completely self-contained. Just roll it into a conference or ballroom, plug in the power cord, and you’re good to go. The system even streams your presentations wirelessly!